It has always been a great pleasure to work on this project. However, it is time to say goodbye. I am going to shut down Terrarium TV, forever. I know this day will come eventually. I know it would be hard to let go. But it is really time for me to move on to other projects. Thank you for all your support through the years. Thanks to all Terrarium TV supporters and communities. Thank you, Nic, and all the people around the world who care about this project. 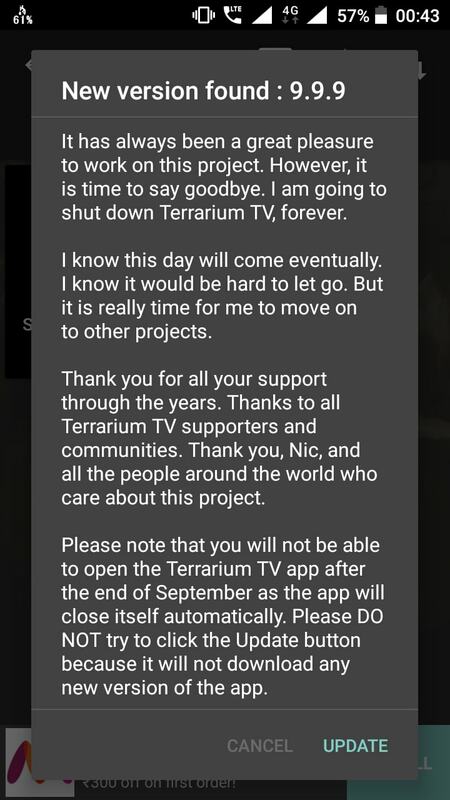 Please note you will not be able to open the Terrarium TV app after the end of September as the app will close itself automatically. Please DO NOT try to click the Update button because it will not download any new version of the app. Showbox is perhaps the app which inspired Terrarium TV. Thus, it has all the latest tvs and movie shows which you are looking for. Like Terrarium Showbox too isn’t available on the Play Store and needs to be downloaded separately. FreeFlix HQ is perhaps the best alternative when it comes to Terrarium TV for its Netflix content. Freeflix has a large number of Marvel Movies, Netflix Originals which can be downloaded or even directly streamed online. Besides, Freeflix HQ even has a Chromecast support which lets you stream directly to your TV via your ChromeCast device. “If you are a true movies and TV Shows enthusiast, Tea TV is the only app you will ever need” says their official website, and we can disagree no more. Tea TV lets you watch trailers, read reviews , and watch movies, tv series easily on your mobile. It even lets you keep you track of which movies and episodes you have watched so you do not repeat the episodes saving your time! Popcorn Time is a free software bit torrent client which includes an inbuilt media player. Thus, this allows you to use any torrents website to watch your favourite movies and videos directly inside the popcorn time app. All you need to do is search for your movie or episode, select the video streaming quality and sit back to enjoy the movie or show. LeonFlix may be defined as the brother of Popcorn Time, as they work on similar principles. While Popcorn time generally searches the big torrent network for your movies and tv shows, Leonflix searches all the popular video sharing and uploading websites. In the end, after searching it lets you play the video which you searched. It also has its own wide catalog to search from. This is perhaps the oldest method to browse and download tvs and movie shows, and still works flawlessly. The bit torrent protocol or p2p is still the first place where you can download or watch tv shows. Previously , you required a torrent client installed on your system to download and watch movies from torrents, but now even that isn’t necessary. You can simply use the Torrent Streaming Sites to leech and stream torrents directly online without downloading them! This used to be a good alternative but its not that close to Terrarium TV. We would recommend you to try out Tea TV covered earlier, or the showbox app. And then if both of them don’t work, MegaBox HD will be good as a backup. Thus, these are currently the best alternatives to Terrarium TV after its shutdown, incase f you know of any other good alternative or face any issues feel free to let us know in the comments section below.